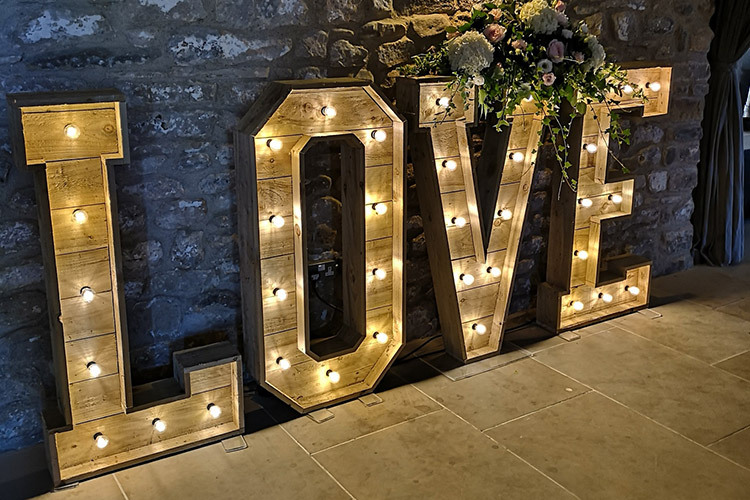 Stunning statement décor to make your wedding or event stand out… Including Yorkshire's best quality, and widest choice of, floral and light up letters to hire! We are proud to supply the whole of Yorkshire with bang on trend Wedding décor for hire. We do not offer the ordinary! Our collection of illuminated letters is the widest choice in Yorkshire. 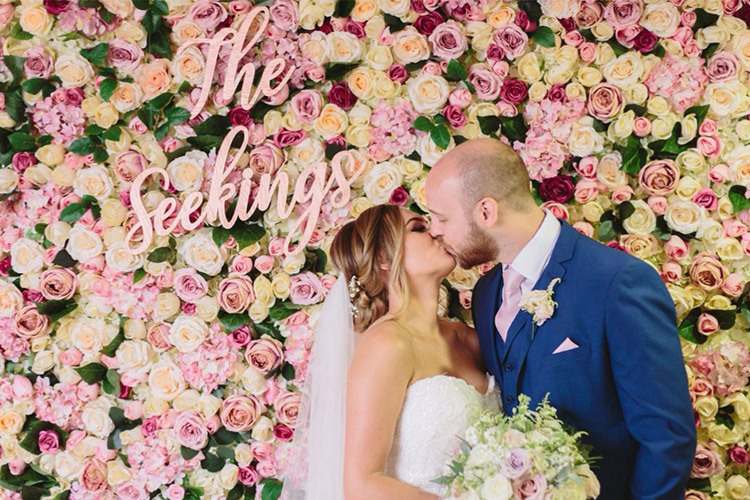 See our Wedding Catalogue for the full array of gorgeous Wedding décor pieces we offer, including our beautiful floral love letters, our reclaimed Rustic love letters for hire, and our stunning rose gold wedding décor. 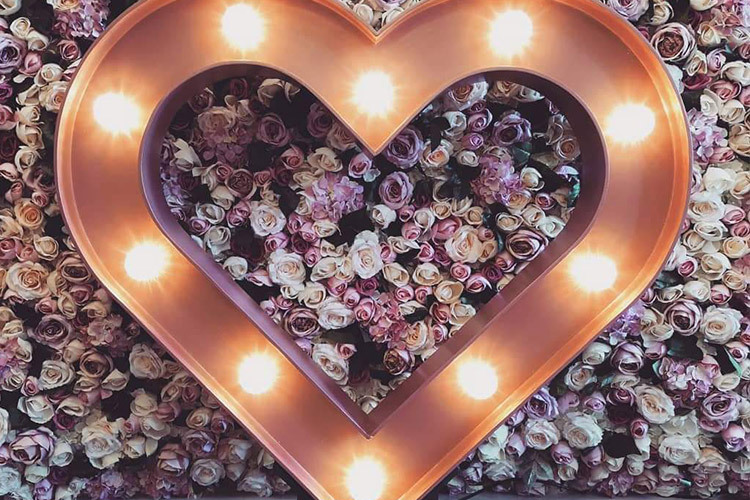 Perhaps you'd like your wedding to be totally personalised with your new surname in lights? – we have the whole alphabet and more in our White Collection! Looking for Corporate event décor? - Hire our illuminated letters to grab attention for your brand, or to help your company celebrate! We are able to spell any word in lights, and our light up hashtag to hire is a great idea for the most social media savvy brands – see our Corporate page for more ideas! Are you organising a Birthday, Anniversary or Christmas party… or any event at all?! – We hire birthday numbers in lights in Yorkshire too! Use these alongside name (s) or initials to really make your event special! And why not add an exclamation mark for added impact?! Or perhaps use different coloured bulbs? 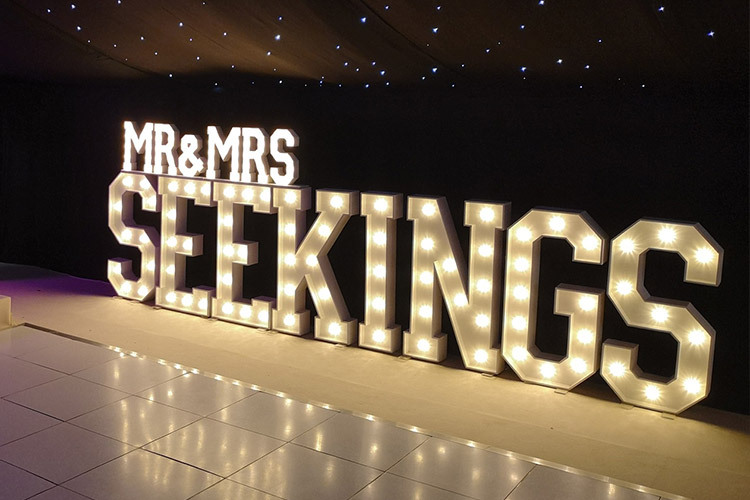 – We offer an array of different coloured light up letters for hire! Everyone loves a bit of sparkle at Christmas! Hire our 4ft XMAS to make your event really special! Or something a little different such as NOEL, or simply PARTY? – We can offer any Christmas light up letters for hire! Our large light up numbers are great for your New Year's celebrations too! School leavers deserve a special celebration – hire light up numbers of their special year to help them make and capture the best memories at their Prom! We have been delighted to help an Army regiment come together at their annual ball with their regimental initials in lights – want to make your Army or Navy ball extra special? – Enquire about out light up letters to hire in Yorkshire here! We have teamed up with a very lovely local photographer Sarah, at Sugar Photography Wakefield, to offer kids or family photoshoots in Wakefield with a difference! We offer individual children's shoots with the initial of their first name in lights… don't forget you can choose any colour! Register your interest here! We are very conveniently located smack bang in the middle of Yorkshire, which means we can comfortably service all the wonderful Wedding venues across Yorkshire, including Leeds, Sheffield, Huddersfield, Halifax, Bradford, North Yorkshire, South Yorkshire, West Yorkshire, East Yorkshire, Hull, Barnsley, Doncaster, Rotherham, Wakefield, York, and Harrogate. We are also delighted to welcome enquiries from Nottinghamshire and Derbyshire, and will do our best to get to you too! We have worked with some real favourites in Newark such as Stubton Hall and Cripps Hazel Barn.